The Knights of Columbus is the world's largest Catholic family service organization. Please browse our website for additional information about this wonderful organization and our local council. The Knights of Columbus is the world's foremost Catholic fraternal benefit society with nearly 2 million members throughout the United States, Canada, the Philippines, Mexico, Poland, the Dominican Republic, Puerto Rico, Panama, the Bahamas, the Virgin Islands, Cuba, Guatemala, Guam, Saipan, South Korea, the Ukraine and Lithuania. The Order, comprised of more than 15,000 local councils, provides members and their families with volunteer opportunities for service to the Catholic Church, their communities, families and youth. Since 2000 alone, the Order has given more than $2.5 billion to charities. Knights have also volunteered more than 1.1 billion hours since 2000, valued at more than $23 billion! Membership in the Knights of Columbus is open to men 18 years of age or older who are practical (that is, practicing) Catholics in union with the Holy See. A practical Catholic man is one who lives up to the Ten Commandments of God and the precepts of the Church. The Order is dedicated to the principles of Charity, Unity, Fraternity and Patriotism. An Admission Degree exemplification ceremony, by which a man joins the Order, explicates the virtue of charity. He is then said to be a "First Degree Knight of Columbus" and after participating the subsequent degrees, each of which focuses on another virtue, rises to that status. Upon reaching the Knighthood (Third) Degree, a gentleman is considered a full member of the Order. As a member of the Knights of Columbus you and your family enjoy many benefits including monthly issues of Columbia, the world's largest Catholic magazine; eligibility to join our top ranked insurance program and many more family and personal benefits. 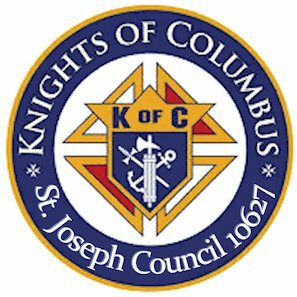 Application blanks are available from any member of the Knights of Columbus and from the "Join St. Joseph Council" tab.